VX61039 THOMPSON, RODNEY EDMOND. Submitted by Aileen Thompson (daughter in law). During his time as a POW, he kept an autograph book which we treasure. In it he has signatures of many who were captured with him. There are also several poems and sketches. Rod asked me to write about this book in the "News Bulletin: The Official Organ of Ex-Prisoners of War & Relatives' Association " No 204 Dated Nov-Dec 1994 Page 19 and we received some very moving replies. The entries are of obvious interest also to the H.M.A.S. 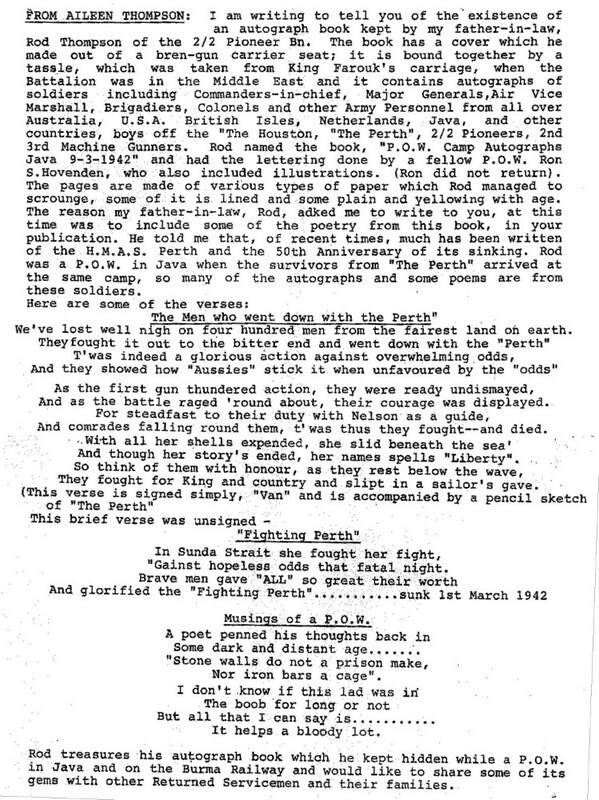 Perth Association.